or butterflies. I sincerely appreciate all the past orders, thank you! recycled materials and decided to make Architectural Bugs too. and an old rusty key at the tail. is a table leg. I joined them using a dowel screw and wood glue. For the eyes, I used clear spiked caster cups that are used for furniture feet on carpet. As if it wasn't funky enough already, I added a pipe fitting at the tail. And then... it is disheartening to see companies copying my art. almost exact replicas of my creations...sad. Mine is on the right in above photo. The set being sold on the left and my original art on the right. metal strapping I used on the body...sigh. He has a rusty iron finial at the tail. and glue all the pieces securely to the back. The eyes are from a drawer pull..
with a rusty hinge at the tail. 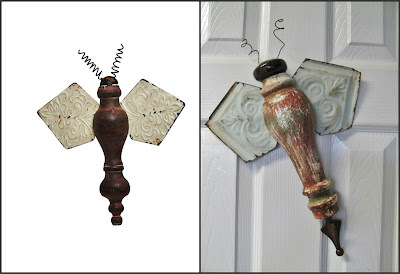 and oversized wings made from a vintage wooden corbel. You find the most interesting parts and pieces to use for your creations. It makes them so much fun. I really love all the ideas you come up with! I am particularly fond of these architectural bugs! Thanks so much for sharing. I can clearly see from your imagination that I can never throw anything away again. Your ideas are brilliant! I can clearly see by your imagination that I can never throw anything away again. Your ideas are brilliant!